Regardless of popular belief, SEO is still important today for any business’s online strategy. Yet one of the most important considerations is choosing a tool that can help you reach your goals. 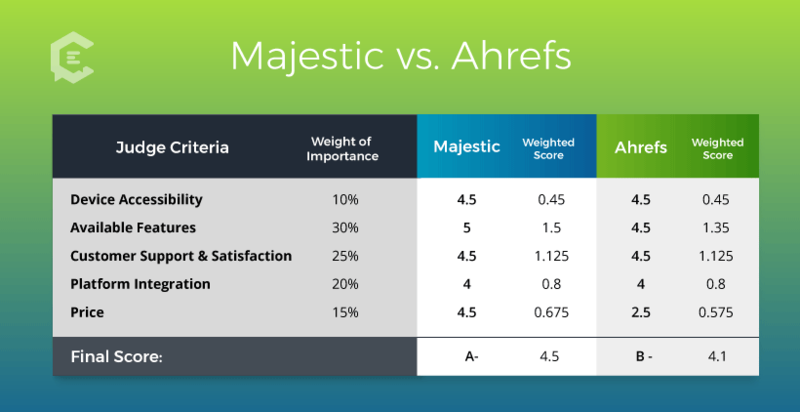 Expert Ben Beck, who uses and reviews countless martech tools, does a head-to-head review of two top SEO analytics contenders: Majestic vs. Ahrefs. Different SEO tool types… Which is right for you? There are a ton of SEO tools available today (over 140 according to Scott Brinker’s Marketing Technology Landscape Infographic), all designed to track and monitor performance as well as integrate with other apps. So, how can you possibly know which one is right for your business? For the sake of this article, we will be focusing on two primary analytical/backlink tools: Majestic and Ahrefs. We will cover optimization-focused tools (SEMRush vs. Moz) in an upcoming #MartechMonday article. To ensure that we perform a fair comparison and review, we have identified several categories of grading criteria to use in our assessment. User-friendliness: How easy or convenient is the tool to use? Can it be used on multiple devices? How does it take to learn, use, and implement? Available features: What are the available features? Are they useful? Customer support and satisfaction: How does the user or customer support system measure up? Does the company provide five-star customer service? How do users rate their experiences? Platform integration: Does the tool integrate easily with other useful tools? What does this process look like? Price: How much does it cost? Does it provide value to the user for the cost? Deep dive review: What is Majestic? 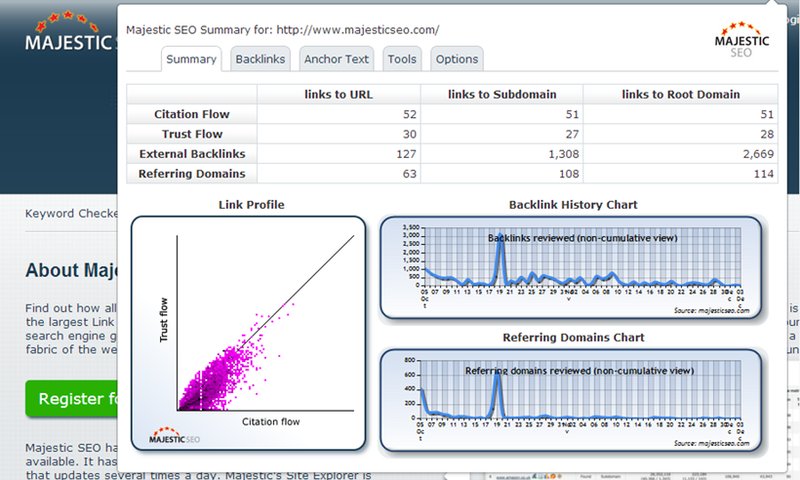 The first analytical/backlink tool we will review is Majestic. Majestic is known for having the largest link index database in the world. With Majestic, users can search the massive link database for specific URLs, domains, keywords, and key phrases. Majestic is used by entrepreneurs, SEO specialists and professionals, developers, and analysts. Compatible with multiple devices: Majestic features a variety of capabilities as well as offers mobile-friendly applications for iPhones, iPads, Android technology, and Linux, making this tool highly convenient and accessible. Majestic also has a fantastic (and free!) SEO extension for Chrome, where you can easily analyze backlinks from the sites you visit. Available features: Majestic boasts nearly 20 features, whereas Ahrefs showcases only half that number. Of course, having access to many features is great, but this really depends on the features that your business actually needs. Price: When compared with some of its competitors, Majestic is also a cost-effective option, especially since it caters to a wide range of audiences and user bases. Depending on your needs, Majestic offers a free plan, a lite plan, a pro plan, and a full API plan. The free plan doesn’t really provide you with a lot of the features and functionality, so you will likely need at least the lite version, which costs $50 per month. Fixed Integrations: Majestic offers integration with four other systems and platforms: BuzzSumo, Web CEO, PiwikPRO, and Covario. In order to take advantage of Majestic’s full API, you will need to upgrade to the Full API plan. Integration flexibility: Although Majestic can integrate with other tools, the list is limited. As we mentioned above, in order to take advantage of Majestic’s full API features, you would have to subscribe to the Full API plan, which can cost up to several hundred dollars per month. This may be a little too high for some businesses and users. Majestic offers multiple plans and features for a relatively low monthly cost when compared with other tools. Majestic also offers both monthly and annual billing. As we explained above, users can take advantage of the lite plan for only $49.95 per month, or approximately $600 per year. Users can also choose to pay $499 upfront on an annual basis, or approximately $41 per month. Deep dive: What is Ahrefs? Ahrefs is the second tool we will review. Ahrefs is described as the “ultimate toolset for SEO professionals”. It is designed to crawl the web and store data related to links and keywords. 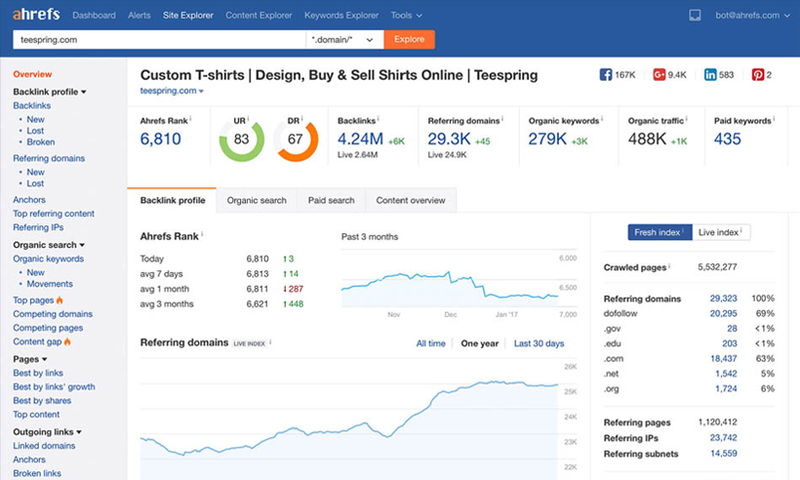 Many users rely on Ahrefs to research keywords, see what keywords their competitors rank for, and to also build content marketing and SEO strategies to grow their organic traffic. User-friendliness: Although Ahrefs might look intimidating for beginners, it is relatively easy to set up and use. There is also a wealth of resources, such as videos and help guides that explain how to get the tool up and running and how to perform various functions. Available features: Ahrefs offers extremely robust internet crawling capabilities, keyword research functionality, domain monitoring and comparison, keyword suggestions, in-depth SERP analysis, and many more. Many users claim that Ahrefs blows Majestic out of the water in terms of usability and quality features and functionalities. One feature that Ahrefs does very well (better than Majestic) is their crawler app (screenshot below). While not as powerful as Screaming Frog, it is more accessible and easier to use, making it an ideal tool for most SEOs or content marketers that don’t have the time to learn more complex tools. My doppelganger (in name), the other Ben Beck, wrote up a great article on Screaming Frog’s advanced functionality, if crawling is worth the extra effort for you. Customer satisfaction and experience: Even though Ahrefs has a slightly lower customer satisfaction rate — 95 percent — when compared with Majestic, Ahrefs utilizes a live customer support feature to assist users and walk them through troubleshooting protocols in real time. This type of support is typically more beneficial and preferred by many users than submitting tickets or sending emails. Price: One of the biggest complaints we found about Ahrefs during our research is that it is expensive. It is actually double the cost of Majestic at $99 per month for the lite version. However, depending on your business and your needs, you may be able to justify the cost of the tool with quality features. Lacks integration: Another weakness or disadvantage to using Ahrefs is the lack of integrations available. Integrations are not included in the standard subscription model. Users or developers who want to use Ahrefs’ API must prove the usefulness of their app and wait to be approved (or denied) by Ahrefs. Ahrefs subscriptions begin with the lite version, which offers clients five campaigns and 300 tracked keywords for $99 per month or $990 per year. The standard version features 10 campaigns and 1,000 tracked keywords and costs $179 per month or $1,788 per year. When comparing Ahrefs with Majestic in terms of cost, Ahrefs is definitely the more expensive option. Since Majestic is a more cost-effective service that caters to different users and is also designed with a wide range of capabilities, features, and functionalities, it is a great option for many entrepreneurs, freelancers, startups and small businesses who just want to get the job done under a tight budget. Ahrefs also caters to users and companies of all sizes, however, the cost of Ahrefs might turn away many. For users who are looking for a highly robust tool, and can justify the cost, Ahrefs might bee the better option for you and your business. So, there you have it: a complete side-by-side comparison and assessment of Majestic and Ahrefs. Of course, each tool has its own strengths and weaknesses, which may or may not be relevant to your needs. We hope that you are now armed with enough information to make the right choice for you and your business. Get a better idea of the cost for your content plans. See how ClearVoice can help you power your content marketing and expand your team’s capabilities. Ben Beck loves working at the intersection of technology, security and marketing. From his early youth selling discount candy from his locker to building his own SMS marketing tool that he sold to the State of Utah, he has learned the value of entrepreneurial thinking and smarter marketing. Connect with him on LinkedIn. Expert Ben Beck, who has mastered countless martech tools, reviews and grades two top SEO contenders: SEMRush and Moz. See which one is best for your team’s needs.